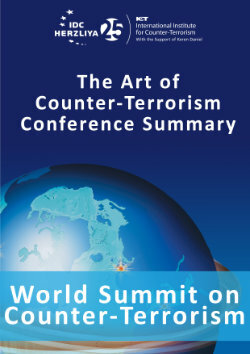 The session was part of the ICT's 16th World Summit on Counter-Terrorism: "Unpuzzling Terrorism". Prof. Bauer claimed that one of the main problems in combating terrorism is that the international community and law enforcement do not have a joint, accepted, definition of terrorism. He argues that there needs to be a radical change in understanding terrorism, through a joint effort between academics and intelligence, conceptual and operational agencies. As it is implied by his title, “Who is the enemy?”, Professor Bauer purports that the main issue counter-terrorists have is that they do not properly diagnose and find solutions for the issue of terrorism, partly because we have yet to agree on a proper definition of terrorism. For example, terrorists and terrorism are often confused with political resistors and resistance. He cites the example of the German occupation of France. The French resistance was supposed to be terroristic, but depending on which side you were on, the Resistance could be considered a terrorist organization or simply the Resistance. Furthermore, terrorist organizations are considered terrorist only based on whom they attack. For example, when the ETA attacked the Prime Minister of France in the 1970’s to try to gain independence for Basque country, all the democrats of the world cheered because the target was a dictator of an occupied country. But in the 1990’s when the same terrorist organization, the ETA, bombed a mall in Barcelona, everyone was upset because they attacked innocent people. Terrorists don’t discriminate—anything and anyone can be a target. As long as we cannot agree on how to define terrorism, it is very hard to fight and to unite in the struggle against it. Most international conventions on terrorism discuss how to fight terrorism without knowing it. The problem is—we don’t diagnose, we sometimes give a prognosis, yet we have the best debates on therapy in the world. And as we see, terrorism has evolved, it has mutated. Before the collapse of the wall, terrorism was more singular and easier to handle. After 1989, when the “communist terrorists” were defeated, terrorists popped up without strictly political motives. For example, Khaled Kelkal in 1995 was a pure criminal without ties to a specific organization, like a hybrid terrorist. We were more comfortable fighting the enemy we knew and understood, but terrorism evolved and is still evolving. Now the new form of terrorism is ISIS. Professor Bauer claims that ISIS is just a criminal gang created by Zarqawi that suddenly became the holy Sunni alliance. We forget that ISIS has an ancestor that we know but ignore, Ikhwan—the first organization created by the Sunnis and Abdul Wahab, whose mission was to conquer the Arabian Peninsula. Nowadays, when we have one casualty or 1,000, we have the same media effect—so they have much more control, they are winning in the communication battle what they are losing in the casualty battle. Furthermore, the members of the caliphate are connected, disconnected and strangely connected; it is always a surprise because we have no way to really monitor them. We also are dealing with converted terrorists that were not previously in the scope of possible terrorists: foreign nationals, women, and children. How do we properly profile this more “custom made” terrorist of today? In France, the debate is on makeup, structure and size of intelligence, when our real problem is our misunderstanding of new terrorism when it appears because of purely cultural disconnect. This radical change in western culture and understanding of terrorism needs to happen through a joint effort between academics and intelligence, between conceptual and operational. Our current culture of phones and immediate response through social media has created a culture of bias—we want terrorists that we like, that we know and that we understand.